We, the Eagle Scouts of the Boy Scouts of the Philippines, have organized ourselves into an association to perpetually kindle in our hearts and minds the true spirit of the Scout Oath and Law; to strive and spread the values of leadership and service by leading and guiding other scouts to achieve the highest rank in the scouting movement, that they may become responsible citizens of the community and to foster and strengthen among ourselves the scouting ideals, do ordain and promulgate this Constitution and By-Laws. We, the Eagle Scouts of the Boy Scouts of the Philippines, have organized ourselves to perpetually kindle in our hearts and minds the true spirit of the Scout Oath and Law and to strive and spread the values of leadership and service. The Citizen Award, Rizal and Eagle Scouts (CARES) National Association was founded during the 12th Asia-Pacific/9th National Jamboree in 1991. This is an organization of Scouts who attained the highest rank in the ladder of advancement such as Scout Citizen Award, Jose Rizal Scout Award and Eagle Scout Award. Eventually, during the Centennial Jamboree in Clark Field, Pampanga in 1998, CARES changed its name to Eagle Scouts Association of the Philippines (ESAP). It started its ESAP milestone in the 1st ESAP General Assembly held last May 23–25, 2008 at Columban College Hotel, Olongapo City with the theme: "Eagle Quest and Beyond". It was hosted by ESAP Olongapo Chapter headed by CSE Mario Esquillo, Chapter President. However, during the ESAP NATIONAL CONCLAVE on 15-17 May 2009 at the Leyte Park Hotel, Tacloban City, in response to the Logo and Name concerns, we decided to change ESAP to ESOP, which means Eagle Scouts Organization of the Philippines. As provided on our ESOP Principles and Objectives, the Organization is non-sectarian, non-political and non-commercial. We are to foster brotherhood among the highest rank awardees throughout the Philippines. We committed ourselves to assist and help the Boy Scouts of the Philippines in the promotion of its advancement program and to encourage all Scouts to attain the highest rank; to encourage all former Scouts who have attained the highest rank to become active members again in the Scouting Movement and to help in the development of young boys and girls to become good citizens of our country; to harness the potentials of all Scouts to become good leaders in order to be of service in their respective communities; to coordinate and to collaborate with other Scouts on common program activities which need collective support by the Boy Scouts of the Philippines; to provide and undertake capability building and efficiency training development to all members of the Eagle Scouts Organization of the Philippines. 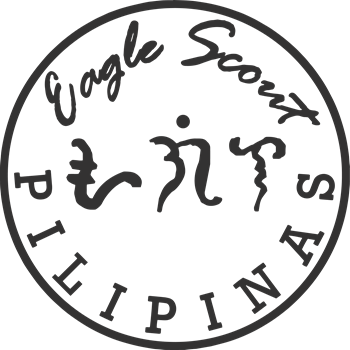 By 2009, the Eagle Scouts Association of the Philippines transformed into Eagle Scouts Organization of the Philippines (E.S.O.P), following the suggested SEC Registration Name. For list of some ESOP - Local councils, please proceed to AGILAS LINKS page. 1. The Organization shall be a non-sectarian, non-political and non-commercial. 2. To foster brotherhood among the highest rank awardees ( Eagle Scouts, Rizal Scouts, and Scout Citizens) throughout the Philippines. 3. To ASSIST AND HELP THE Boy Scouts of the Philippines in the promotion of its advancement program and to encourage all Scouts to attain the highest rank. 4. To encourage all former Scouts who have attained the highest rank to become active members again in the Scouting movement and to help in the development of young boys to become good citizens of our country. 5. To harness the potentials of all Scouts to become good leaders in order to be of service in their respective communities. 6. To coordinate and to collaborate with other scouts on common program activities which need collective support by the Boy Scout of the Philippines. 7. To provide and undertake capability building and efficiency training development to all members of the Eagle Scouts Organization of the Philippines.